There is a wonderful little gadget for making radio recordings called the dradio-Recorder. 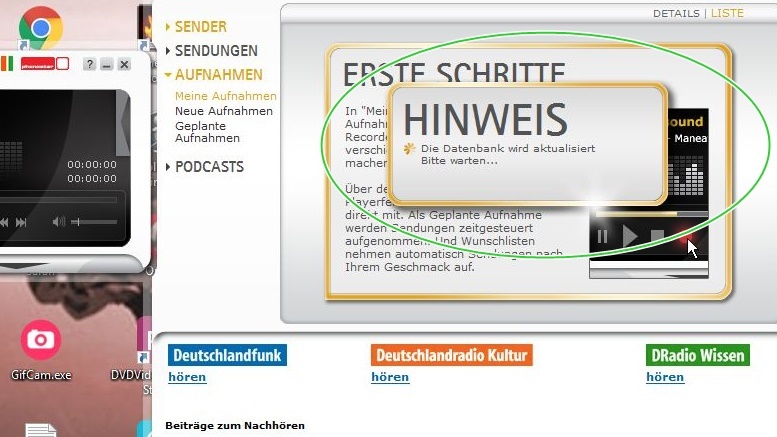 It’s issued by the Deutschland Radio (hence the name). A word of caution: whether recording for private use will most probably be legal, what you do with the file afterwards might not be. Ask a lawyer, if in doubt. 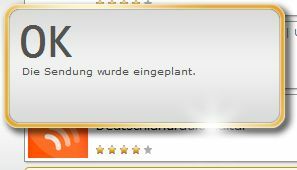 It’s ultra-reliable, easy to use, but it comes with a major drawback: there is no English version. But don’t fear – I’ll walk you through! It will probably take some time updating and syncing the station database – usually around five minutes. For the recorder to work, your PC needs to be on, obviously. 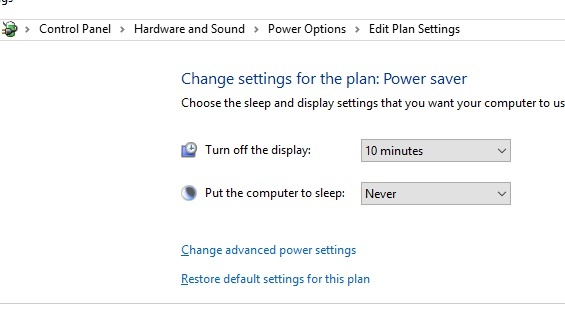 While you are recording, I would always choose “Sleep – never” in the control panel settings under “energy options” of your PC. Also I would turn off anything else on the pc that goes “pling!” like notifications. Theoretically, the recorder might even manage to only record the intended audio, but better safe than sorry. You might want to try it out before you actually need it. 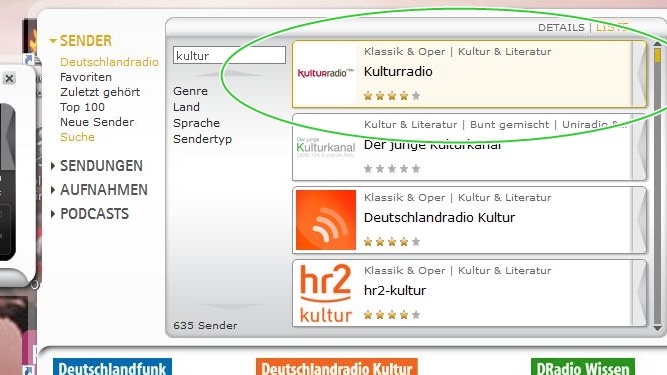 For example, let’s say we want to record Kulturradio rbb. I select this channel, right there on top now. Now here is the one thing that is a little tricky about that program: See the little slider on the right? 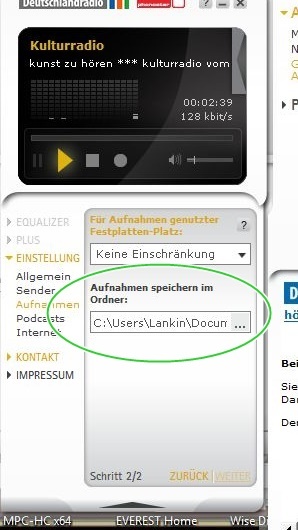 Once you click or hover over it, it slides out, and you can select “aufnehmen” – record. Choose that. You are guided to a little popup where you can assign the time-span, and name your file. Best pick a name you are likely to find again later. (I’m talking from experience.) The time is your local time. (At least I am almost 100 % sure about it.) Be sure to convert if necessary, and again, try it out before you actually need it. 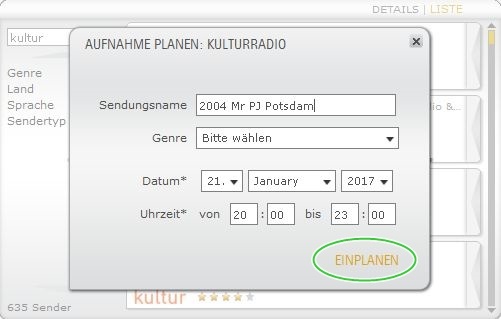 Now, this is important, choose “einplanen” – schedule. Where does my file go? As in most programs, you can assign the file location. 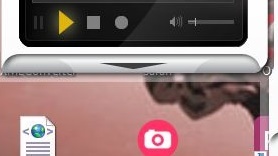 This is hidden under yet another slider. See the little triangle there, under the amp display? … and choose the file location. Make sure you got enough space on the partition you choose! 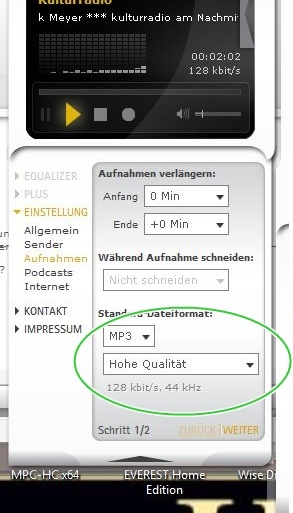 Just for orientation: an hour of best quality .mp3 will be around 100 MB. An hour of .wav is going to be around 1 GB. Oh, one last thing. After so many prosaic words, let me teach you a few others, because German is actually a beautiful language. Zauberstimme (noun, f.) – ‘miracle voice’ or ‘enchanting voice. It’s a compound noun, comprising of two other, shorter words: “Zauber” (noun, m.) – something between mystery, miracle, magic and enchantment. “Stimme” (noun, f.) – voice. Anyway, have fun with the dradio-Recorder!